The Oculus Touch controllers, which look like pistol grips with plastic wrap-arounds, help to provide the tactile sensation that you're actually gripping an object, which makes the controller a lot easier and more intuitive than other motion controllers or Xbox's camera-based Kinect. When you pick up guns in Bullet Train, you can take them by the grip in either hand, or use your off hand to steady the rifle barrel or pump the shotgun. And in general, the feeling of holding a gun when playing Bullet Train is fairly convincing. In other contexts, the Touch controls require you to train your brain a bit. They simultaneously feel natural and unnatural in the way they simulate picking up and manipulating objects. Touch controls include two main triggers on each hand: one under the index finger, and one under the middle finger. The middle finger button is meant to represent opening and closing your grip, while the index finger is reserved for pushing buttons or, of course, pulling actual triggers. Picking up something like a ping-pong paddle takes getting used to, as the middle finger button isn't something our brain is used to having to press. Put a gun in the paddle's place, however, and suddenly the scheme makes a lot more sense to your brain. Especially among Americans, a collective culture of childhoods spent with Nerf blasters and Super Soakers (to say nothing of handling actual weapons) makes picking up a virtual weapon with Touch an instantly recognizable sensation. 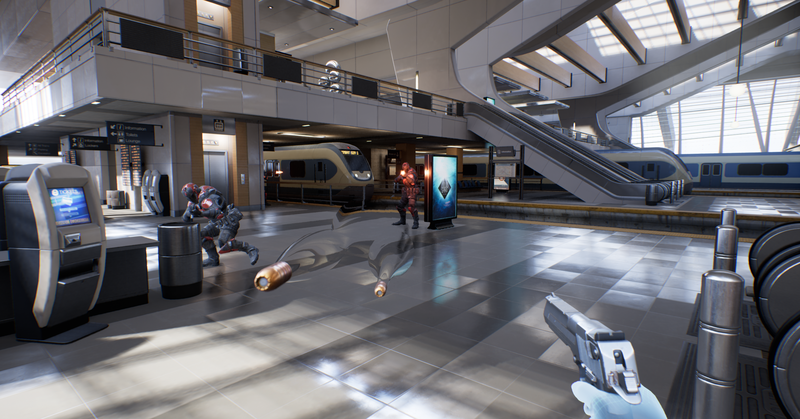 The Touch controls are shaped more or less like pistol grips, further increasing the immersion of the experience: you pick up a gun in Bullet Train and it's not far off from what you'd expect it to feel like when holding one in real life. That immediately makes Bullet Train feel like a more tactile, true-to-life shooter experience than just about any game that's come before it. You can look around the room, kind of feel the weapon in your grip, and aim using your hand and arm. Suddenly, your shooter experience goes from The Wizard to John Wick, at least in terms of how it feels to play.